Advance Whole Horse Dentistry Learning Center teaches beyond Equine Dentistry in a brand new way. Applying the science of oral biomechanics to our dental procedures. This bite alignment technique has been trademarked Natural Balance Dentistry . Our goal is to provide the Horse with the ultimate in dental balance that we have proven (under the guidance of our Director - Spencer LaFlure, ACEqD) actually fits the horse by returning centric relationship of the TMJ, enhancing overall movement and performance as well as developing muscle mass in the topline. We believe the ultimate in dental balance to be a new technique developed by Spencer LaFlure. That is balancing the mouth starting with the front teeth first, setting up the paradigm, then going on to balance the molars (maximizing surface to surface contact) and the TMJ to fit each horse anatomically. As 40 million years of evolution can’t be wrong but 100 years of bad opinions could be. With these advanced biomechanical techniques affecting the entire horse’s ability to maintain mass, motion, and soundness and rebooting neurological signals from the TMJ to the body, we achieve the results that others hope for. And we call this. 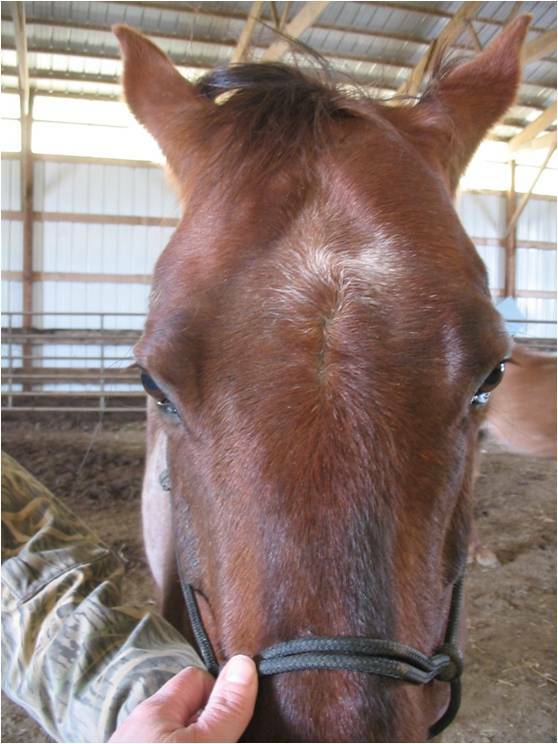 NEURO MUSCULAR HORSE DENTISTRY. I, like everyone else, had to find out the hard way that not all practitioners and not all methods are created equal. After experiencing the ill effects of poor dentistry work on my horses, I vowed to find a better way. Not just for them, but for all horses out there within my reach. My horses have been wronged by so many people claiming to know what they are doing. People who paid good money to get educated in something that doesn't work. People who do not put the horse first. People who do not care to move on, start over, find a better way, get re-educated, OR learn something else when they find out what they are doing does not work. Nope, no more. If it takes me until the day I die, I will continue to learn, I will continue to change, I will continue to grow, and I alone, will be the one accountable for everything that goes on, or into, my horses. I will do the work, and I will do the time, and after nearly two years of study, I certified in Natural Balance Dentistry in November of 2009..
To continue; Upon examination of my horse's mouths, It was obvious that the dentition in all of them had been severely compromised by the last practitioner who had used a power float. I was really devistated to learn that Glory was lacking occlusion in the molars. 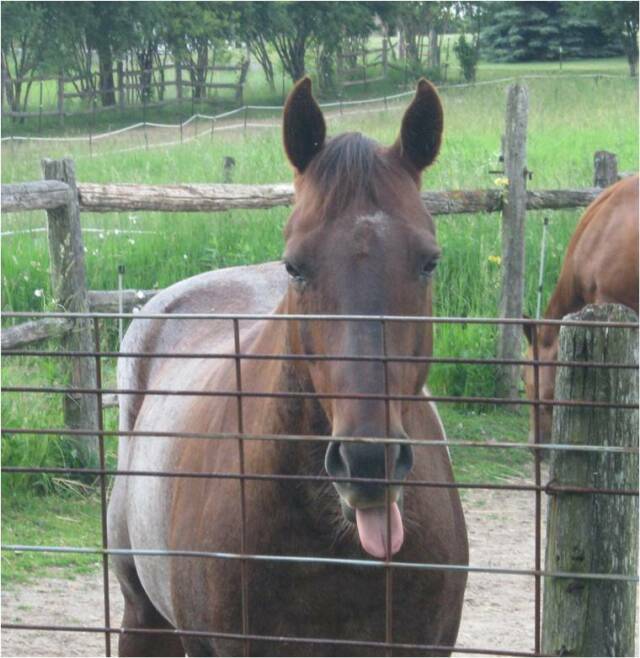 Glory, being an older Arab, which I rescued (who most likely did not have much work done to her in the past other than a typical hand float by the vet) had developed a wave in her mouth. By power floating the molars to an unnatural length and angle, her molars were no longer coming together as they should, and due to her age, Glory's teeth are not erupting at a rate where this can be corrected any time soon. The other issue with Glory is that she is missing one of her lower incisors. This had caused the opposing upper incisor to become too long and was actually inhibiting her chewing motion. The last practitioner had power floated this incisor down at the last visit. Actually, he had ground down all the incisors. I remember seeing the gums bleed as he worked. I was told that this is common with the vibration of the instrument. Now I am seeing the results of the damage. Two of Glory's incisors are now dead, as well as one of her molars. The one protuberant tooth was very (wiggly) loose and bled when the tooth was touched. I can only speculate how this happened, but I think I am correct with my suspicions. Now I have vowed to make this up to her and help her as best I can over the next several years. Unfortunately, at her age she is erupting at the rate of about 1/32 of an inch per year. The type of correction she needs cannot be done by removing more tooth, only by allowing them to grow, as I continue to, ever so slightly and in a precision manner, support the angles of the molars and continue to maintain the incisors. As a result of adjusting the incisors so they have occlusion on the healthy teeth and not on the hyper erupting incisor, she has since tightened the gum tissue surrounding that tooth. The tooth is dead, but it can stay and continue to function, at least for a while. Glory's attitude has improved. She is cheerful and appears to be eating at the same rate as the younger horses. Her posture has improved and she appears to be much more comfortable. 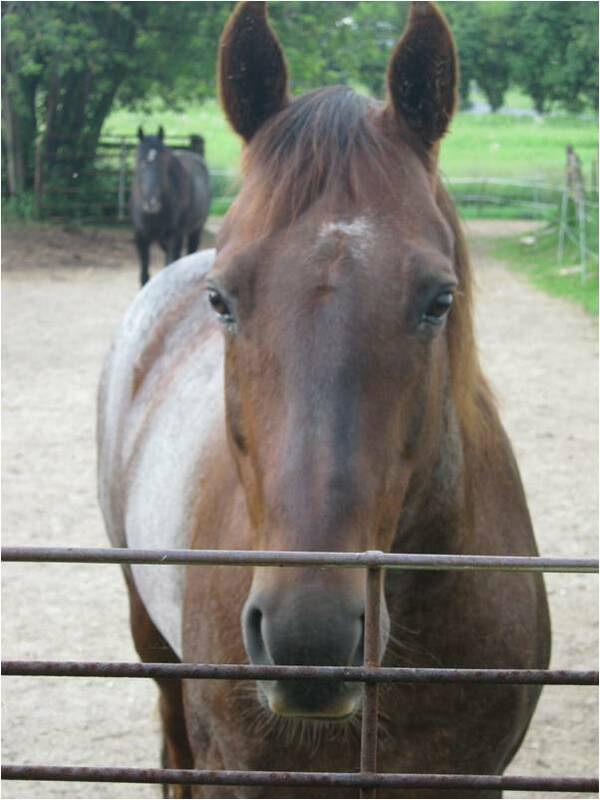 Glory is a wonderful horse and deserves to be healthy and happy. I am glad that I will now be responsible for maintaining this extremely important function on all of my horses. Cody is another horse which I suspect had been power floated in the past. 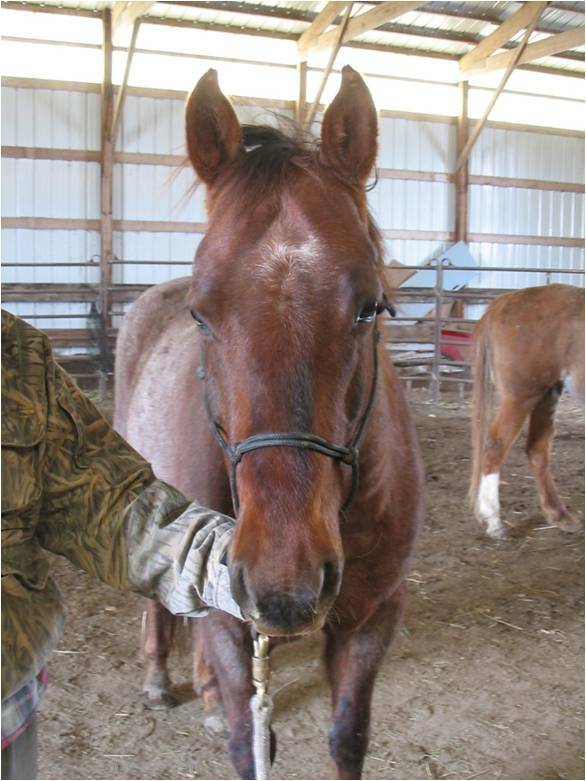 Cody was informally diagnosed as having navicular when I brought him home. Upon bringing Cody home, he was dead lame. Cody could not walk on grass. It was painful to watch. Cody has the best personality. A real comedian and a regular houdini with zippers and ties. You can't help but giggle when Cody is around. Because he is such a fun loving and nice horse, I was more than happy to bring him home, give him a natural lifestyle, and work with him. There is no pressure to "fix" him, but I was going to try my best for the remainder of his life. Of course I started with the hooves. Cody improved daily. In fact, Cody improved 90% over the next year, but there was still something about him that just wasn't right. He looked stiff. Stiff everywhere. When he came to me his whole body was hard as a rock. I had been loosening him up with deep tissue masage, which he has come to love. This had loosened up his muscles so they now are soft and supple. 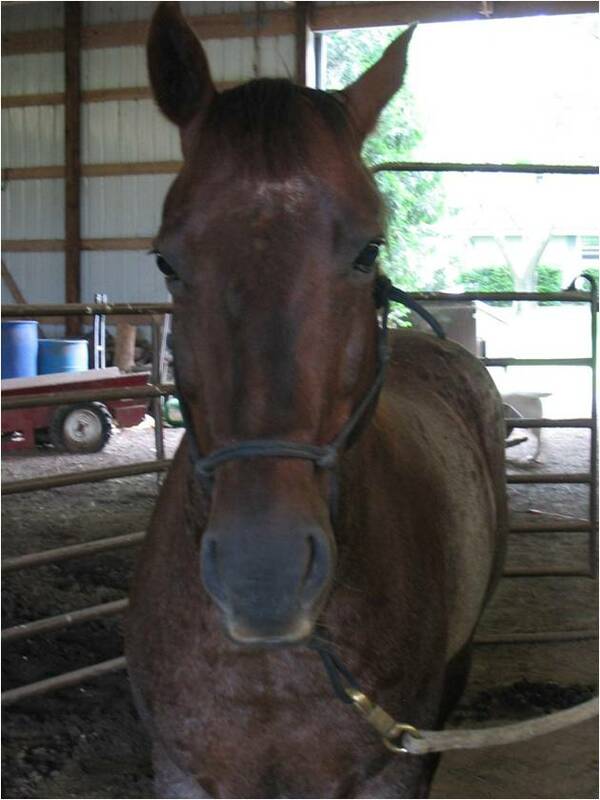 I am sure the change in living environment, as well as diet, and hoofcare, has all helped him but his trot continued to be short and choppy, his head way up in the air, and no extension at all. As if the knee had no action to it. Watching his feet come on the ground, landing heel first, hoof sound on all terrain, I was convinced that this short, stiff, appearance was not hoof related. I was now on a mission to figure this out. Cody has been improving. 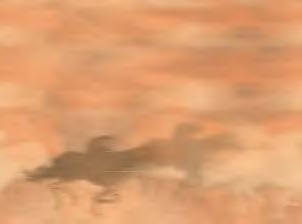 His posture has been changing and he is now trotting and running on the track just to "get there faster". Because he has been "locked up" for so long and his body's propreoception has been such for several years, I think it will take some time to get him to believe that his body can move more freely now. I will most likely support him with continued body work so I can re-train his propreoception. This function needs to be "rebooted" in his brain. I have also started to ride him so I can help guide him into doing some movements and encourage him to bring his head down, to move with more flexion and extension, to bend laterally, and to trust that his body can make these movements. I truly hope that I can restore him to his glorious self. I would love to have him as my main trail horse someday. I realize that there could be some permanent damage that may prohibit him from reaching the goal I have set for him, but until I have reason to radiograph and/or seek a veterinarian diagnosis, I will be positive and continue the path I am on and continue to celebrate each milestone and change I see. Below are some photos of Cody's face. He had always looked so odd with his eyes set back and his ears set kind of wide. narrow chest, and wide, thick, neck. In June of this year, while out to feed, Cody had been standing at the gate waiting for his breakfast. I looked at him and I remember thinking "Wow. You look different" "You look so pretty". I decided to go get my camera and take some photos. I knew I had taken some photos of his face prior to working on his teeth. The comparison was amazing to me. I wanted to post them on my site for people to see the change. What I had noticed about Cody's appearance were his eyes. Not just the angles and how they have almost both come forward, but the brightness and the more relaxed look they have. His ears have come closer together. 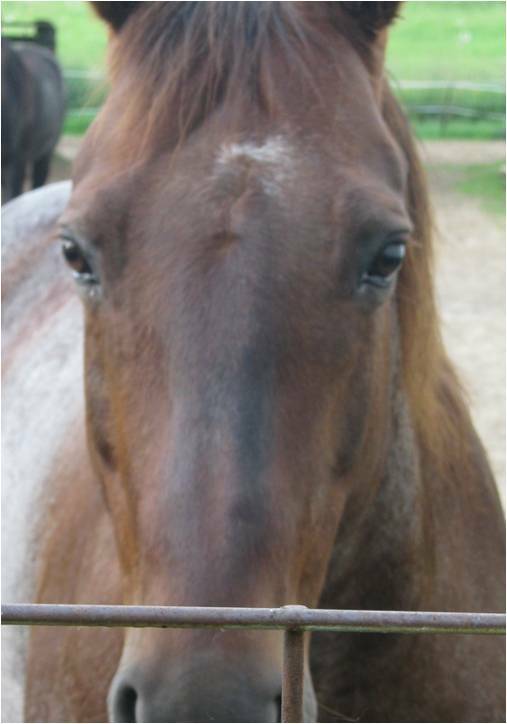 His temporalis muscles on his forehead have decreased in size and are soft. Where as in the before photo they were rock hard. His chest has widened and his neck has become more slender. His shoulder has changed in the muscling and appearance. He just has an overall more healthy and comfortable appearance to him. Even his coat is healthier looking now. These changes have appeared within a matter of weeks. The changes can happen more quickly if the balance is followed up with acupuncture, or other form of body work which involves "neurological re-booting" or muscle retraining by a qualified and licensed practitioner. I was very impressed with the changes that Cody was able to make on his own at this point. I will continue to document changes as they occur. Cody's journey to date has been long (2 years), but thoroughly enjoyable along the way. We were able to enjoy him, let him be a horse, and yes we could ride him while he repaired his lifetime of damage. I just want to remind people that healing takes time. Don't rush. Let whatever you are doing work, don't be so quick to move on to the next treatment. I think we fail our horses in this way. Not to mention drain our pocket books. We try something, we wait, what?, a day? a week? Nope, no change, what's next. Move on. I am fortunate that my situation with Cody did not need to be rushed. I allowed him the time he needed to respond to what I was doing. He will always have a home with me, and he will continue to teach me about the horse's healing ways. I always seem to take "The Long Way Around" when it comes to my horses. It doesn't matter. What matters is what I have in the end, and that I can always, at the end of the day, sleep well with my decisions and the path that I have chosen. 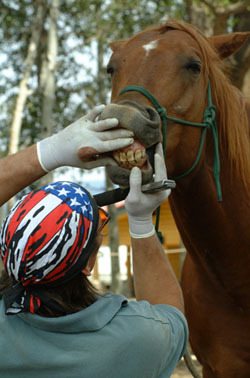 Natural Horse Dentistry - What is the Point? What is Natural Balance Dentistry?